Keeping your college dorm room organized is key. To do that, you need to invest in dorm storage solutions and dorm organizers for your college dorm room. However, you're also living in a college dorm room, so the dorm organizers you add need to be compact. For a compact dorm organizer, add our 3 Tier Dorm Space Saving Shelves to your dorm essentials - these dorm space savers suction right onto your dorm mini-fridge so you get plenty of dorm room storage without losing a lot of space in your dorm room! 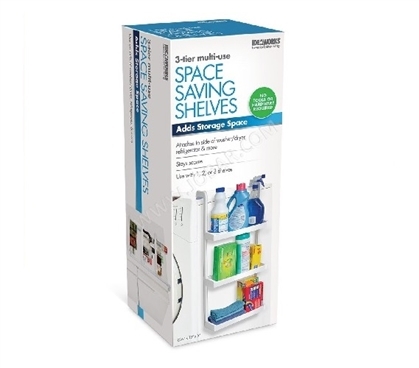 Our 3 Tier Dorm Space Saving Shelves have a suction cup design that can suction onto your dorm mini-fridge and keep your college supplies in a convenient location. For a little bit of dorm room storage, you can hook up one or two shelves, or for maximum dorm room storage, you can hook up all three shelves! These dorm storage solutions are perfect for cleaning supplies, towels, food items - whatever you need for a more efficiently running college dorm room. Plus, with having these dorm items on your college mini-fridge, you can have everything you need for cooking or cleaning in one convenient spot in your college dorm room so you don't have to search throughout your college closet (or clean up spilled food off of your clothes).